One day when having a cheeky scroll down my Facebook homepage I happen to spot the most delicious looking vegan pizzas covered in cheese. Immediately I stop and rub my eyes to check I'm not dreaming and my eyes are fooling me. Sure enough, they are not. The pizza is vegan and still loaded with cheese. It just so happened that with an amazing bit of luck that these pizza's were from Sheffield, the very same place my boyfriend lives, who I happened to be visiting over the course of the next two weeks. 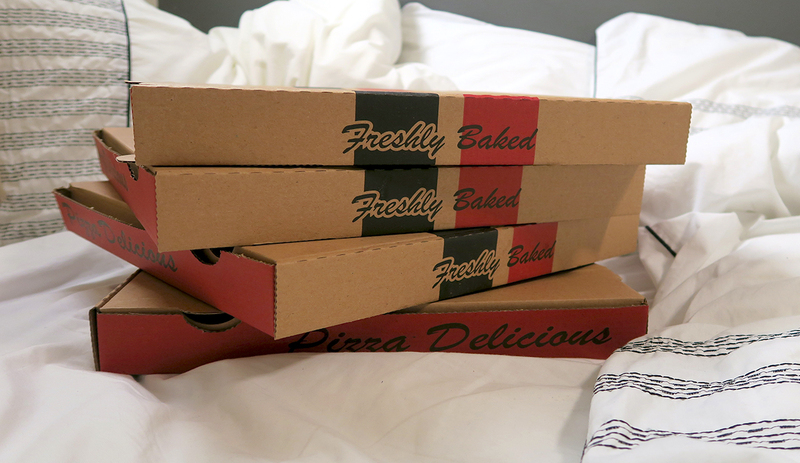 So what did we order for Valentines Day... four pizzas. Yep. Four. Porter Pizza were having a two for one Valentines deal for those wanting a cosy night in (exactly what we were after) you just had to share their tweet with the hashtags they provided. Simple. It just so happened that neither of us could decide on just one pizza we wanted, so we order one off the menu each and we each made our own one. Win, win. Now I won't be all coy and say that my eyes were bigger than my belly and I only ate two slices, heck no, I ate two pizzas and they were the best vegan pizzas I've ever had. I don't think there's that much more I can say on the subject, everyone knows how amazing pizza is so if you imagine your favourite pizza in the world, your mind is already drooling. I chose to go for 'Maggie' with obviously vegan cheese, because margherita pizzas are actually one of my favourites and then I chose to have a Maggie topped with black olives, red and green peppers, artichoke hearts, oven roasted butternut squash and fresh basil. Both were delicious, I would hands down recommend my creation to anyone who loves a 'healthy' pizza. 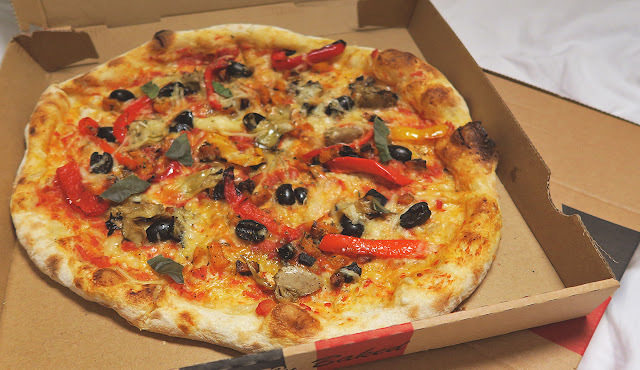 The stone baked base had that authentic Italian crust to it, with cheese that was melted to the point where it wasn't all stringy and pulling away from the pizza when you bit a bit off (I hate that) and the juicy vegetables created a tasty medley in your mouth of sensational flavour. It was all round the most perfect pizza I've had. If you're not convinced by that picture, head over to their website, or better yet order yourself one of the many varieties that they do (Call 0114 267 6672)! The store is closed on Monday's however from 12pm until 9pm Tuesday to Thursday or until 9:30pm on a Friday & Saturday it is open and serves perfect pizza from lunchtime onwards. We ordered at 4:35pm on a Sunday (Porter Pizza is open from 4:30 until 8:30pm on a Sunday) and all of them were done and handmade in front of us within 40 minutes. You can find Porter Pizza at 410 Sharrowvale Road, Hunters Bar in Sheffield. Disclaimer: This post is not sponsored or paid for by Porter's Pizza, this is just my genuine recommendation that I like to give to my readers based on my own personal experiences. Which you can see for yourself in my weekly vlog here.